After roaming the whole day, Joel Sasu-Yiadom was able to convince just two people to buy a product that he sells for a 10% commission. This isn’t the life Joel envisioned. For someone who graduated from the University of Professional Studies, Accra (UPSA) in 2013 and holds a bachelor’s degree in Business Administration, his expectation was to get a decent and sustainable job that would give him a meaningful future. But six years down the line after coming out of the university, he has no decent job. He still lives at home with his parents and two younger brothers. The situation is even more dispiriting when he compares his life with colleagues who are among the fortunate few to have good jobs after school. These former colleagues have been able to wean themselves off their parents’ support and are now taking care of some responsibilities at home. “At this point in my life, I should be the one contributing to the home to reduce the burden on my parents. But I still use the resources at home. My parents still provide me with food and pay the bills. The commission I earn from selling the products only help me with my transportation. I cannot rent a room and pay bills from it,” Joel, 27, told the B&FT. Joel is not the only one in this predicament. A lot of graduates can identify with this unpleasant experience. Most of them have to settle for low-paying jobs just to survive. Kingsley Agbo, a resident of Bonsu in the Eastern Region, completed Takoradi Polytechnic in 2012 with an HND in Accounting. His goal was to top-up and acquire a degree immediately after completing the polytechnic, hoping it would boost his chances of landing a decent job. But because he didn’t have any sustainable job, that goal had to be delayed for two years. Finally, he enrolled in a distance education programme and studied hard to acquire a first-class degree in Business and Commerce from the University of Cape Coast. After boosting his CV, a job was nowhere to be found. Countless applications he wrote to different companies were not successful. He had to eventually take a job as a waiter in a restaurant with his hard-earned first-class degree. “It is very depressing and disappointing to spend all this time and resources to acquire a degree, thinking it will give you a brighter future – and then you find yourself working at a place where you never imagined; and to make things worse, be highly underpaid. “The money I earn in a month is not even sufficient to take care of me alone. I have still not been able to settle as a man, let alone save some money to take care of my mother and younger siblings. I am only praying an opportunity opens for me some day in life,” said Kingsley, 29, passionately. The two gentlemen’s situation is not isolated. In fact, it is actually the norm in Ghana. Many graduates after obtaining requisite qualifications sit at home and become rusty, because there are no jobs for them. 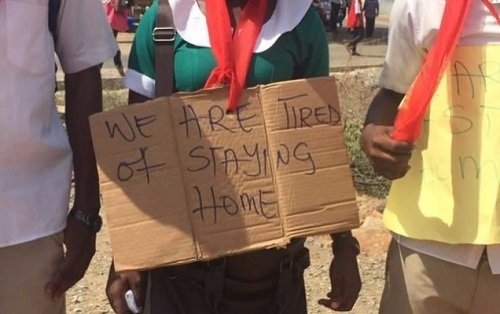 In fact, the Institute of Statistics, Social and Economic Research (ISSER) of the University of Ghana reveals that only a measly 10 percent of graduates find employment after their first year of completing school. It takes as much as ten years for a larger number of graduates to secure employment in the country, the institute says, given the low capacity of the country’s industries, among other factors, to absorb the large number of unemployed graduates. It is estimated that about 80,000 students graduate every year from the country’s universities alone. This means that just about 8,000 get jobs during their first year after school, leaving the remaining 72,000 to their own fate. Yes, that is how serious the situation is. The ISSER research further indicates that some of the graduates have the desire to start their own businesses but lack of capital remains a big obstacle. Ampofoah Agyemang Manu, who also graduated from the University of Ghana in 2016, said she would have loved to start her own business, but that she did not have the needed capital to do so. For the graduates, unemployment has stolen their future as it has delayed many goals and aspirations in their lives. They say it is about time government took the matter seriously and developed workable policies to arrest this ‘thief’.